India modified Foreign Direct Investment (FDI) rules in December for its growing e-commerce sector. The foreign companies like Amazon.com, Wal-Mart Inc etc., are feeling the heat due to the new norms. The new foreign direct investment rules bars companies from selling products through vendors in which they have a stake. 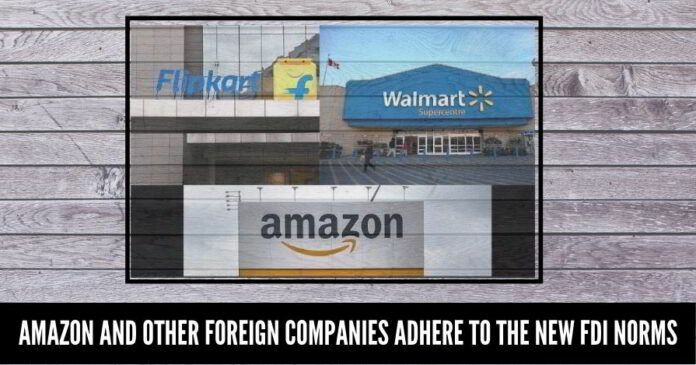 The new foreign direct investment (FDI) policy which comes into effect from today, February 1, is causing a major commotion to the online retail giants – Amazon, Wal-Mart and other foreign companies. The rule averts companies from selling products on their sites in which they hold a stake. Also, companies can’t make exclusivity deals with sellers. Also, the products sold by Vendors like Cloudtail, Shopper’s Stop etc., are no longer available on the Amazon India, as it holds stakes in the companies. Both Amazon and Wal-Mart have taken a major bet on the Indian growing markets. Amazon has stanched to investing $5.5 billion and Wal-Mart has spent $16 billion on Flipkart last year. Amazon and Wal-Mart both have lobbied against the policy and tried to delay its implementation, however, India stood by its deadline. The U.S. government has also urged India to protect the investments of the two American retailers, Reuters reported last week  . However, Modi administration stood by its modification, as the govt. wants to promote small traders. The e-commerce giants control their inventory with bulk buying power from affiliated vendors. They offer high discounts on a number of products and create an unfair market place. With the new policy in place, such practice will be barred and it is also said by Industry sources that the business structure of these e-sellers will change and compliance costs will increase. Amazon India told Reuters it was “committed to remaining compliant to all the laws of the land”, adding that all sellers make their own independent decisions of what to list and when . Amazon Chief Financial Officer Brian Olsavsky was on a conference call with reporters following its fourth-quarter earnings announcement. In his call he asserted that the situation in India is “a bit fluid right now,” but the country remains a good long-term opportunity. The impact of changes on Flipkart was not clear as it did not respond immediately to a request for comment. Chief Executive Kalyan Krishnamurthy said in a letter to India’s industries department in January that the rules required Flipkart to assess “all elements” of its business operations and risked causing “significant customer disruption“. These ‘Retail Giants/Chains’ (whether local or foreign) shrink the jobs by 20:1 as compared with ‘Small Traders’. Do you assume Walmart & Amazon wouldn’t have tried to OIL the Babus?! But Modi Government as it is, is unlike the corrupt Manmohan’s – can neither be bought out nor kneeed down. Can you cite specific & tangible instances where Indian retailers scampered/ cheated on pricing or quality?